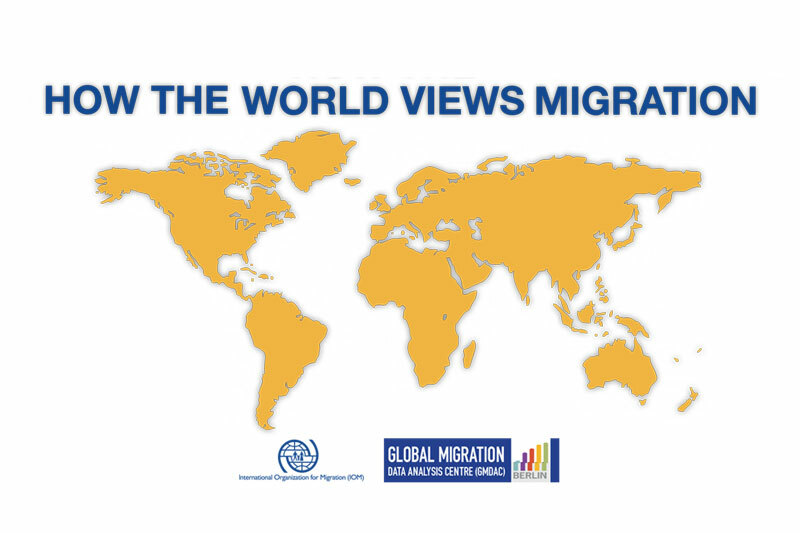 Germany - How the World Views Migration – a newly released report produced by IOM in collaboration with the Gallup World Poll – provides, for the first time, a global overview of people’s attitudes towards immigration. The full findings of the report were presented yesterday at the Global Forum on Migration and Development (GFMD) Summit in Istanbul, Turkey. The study, based on interviews conducted by Gallup with over 183,000 adults across over 140 countries between 2012 and 2014, shows that people around the world are not as opposed to immigration as may be commonly assumed. Some 43 per cent favour increasing or keeping stable the numbers of immigrants in their countries, while only 34 per cent support lower levels of immigration. In your view, should immigration in this country be kept at its present level, increased or decreased? Do you think immigrants mostly take jobs that citizens in this country do not want (e.g., low-paying or not prestigious jobs), or mostly take jobs that citizens in this country want? Residents in the Americas generally showed more positive attitudes towards immigration, with important exceptions, including Mexico, Costa Rica and Ecuador. Australia and New Zealand were mostly positive towards immigration. The same was true for the Gulf Cooperation Council countries, where temporary migrant workers represent the highest percentage the total population worldwide. People in Europe appeared to be the most negative towards immigration, with over half of all respondents favoring lower immigration levels in their countries. Attitudes differed substantially between Northern Europe – with people in Sweden, Denmark and Finland being generally positive about immigration – and Southern Europe, where a high percentage of people in Greece, Malta and Italy wanted to see immigration reduced. The UK represented the only exception in Northern Europe, with over two-thirds of respondents wanting to see lower immigration levels. Results by country and people’s socio-demographic profiles showed that adults with tertiary education are more likely to favor increasing or stable immigration levels than people with lower levels of education. Younger age is also generally associated with more positive attitudes towards newcomers. Those who are unemployed, on the contrary, tend to show more negative views. Another key finding is that people’s perceptions of their personal and their country’s economic situation seem to affect their views about immigration. People who think their personal or country’s economic situation are worsening, are more likely to favor lower immigration levels in their countries, and vice versa. In countries with the highest unemployment rates, more people favored reduced immigration. Interestingly, in countries where migrants constitute between 3 per cent and 10 per cent of the total population, people tend to be more negative, with 54 per cent on average favoring decreased immigration numbers. Adults in countries with higher shares of migrants in their populations are more likely to be positive. Residents in richer countries generally believe that immigrants take jobs that are undesirable to natives – contrary to the often mentioned fear that immigrants will take jobs away from national workers. The perception that immigrants take jobs that citizens also want is more prevalent in developing countries. “Public opinion on migration plays an important role in the design and effectiveness of migration and integration policies in most countries. So we need to regularly monitor it to make sure policies can achieve their intended results,” he added.